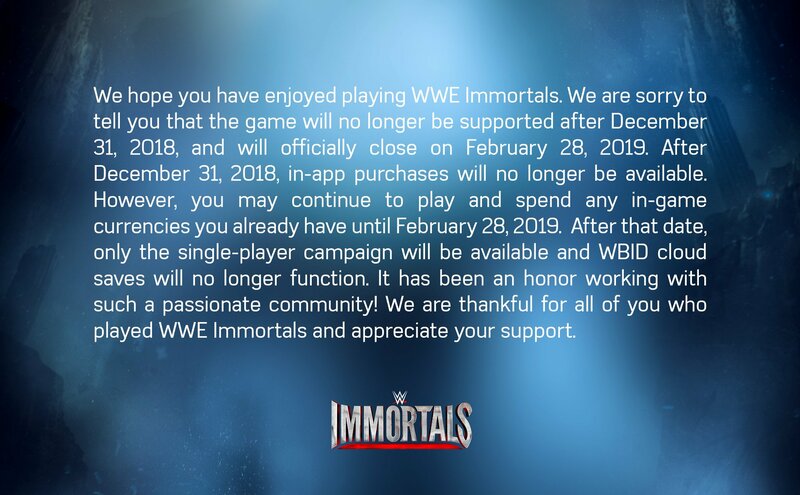 Originally launched on iOS and Android nearly 4 years ago, WWE Immortals (Free) from WWE and NetherRealm Studios was an interesting take on WWE. It basically was Injustice: Gods Among Us (Free) with WWE Superstars and it had quite the fanbase over the years. Earlier this Month, the official Twitter account had some bad news for the game. 2017 and 2018 have been fantastic years for mobile gaming but both years saw quite a few games close or get pulled from storefronts for a variety of reasons. WWE Immortals was probably the most interesting WWE game on mobile even though it didn’t play out like a traditional wrestling game. Hopefully Warner Brothers and WWE take what they learned from this to reboot it or do something better with the concept as there definitely is a fanbase that is sad about the closure of the game. If you still have it installed, you have until February 28th, 2019 to spend any in game currency you have and play the game. After that date, the online cloud saves won’t work. It will only be playable in single player through the campaign after that. The app has already been pulled from storefronts as of this writing. The Google Play listing also points to something not available now. What would you want from a sequel or reboot to WWE Immortals?